Remember free real time strategy game Unknown Horizons which we reviewed few days back? The game has received second update this year bringing in new goodies. Unknown Horizons is an open source real-time economy simulation game with strategy elements. 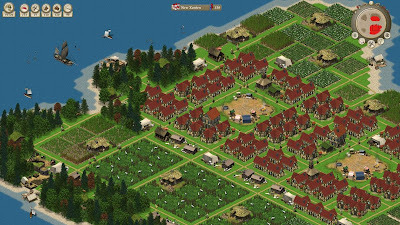 The game is presented in an isometric 2D view. Your aim is to build colonies, collect taxes and use strategic trade policies and diplomacy to maintain a balanced economy. If you have played Settlers and Anno, you will be in familiar territory. New Graphics - Three new building graphics, five new variations, no more placeholders. New assets include tavern, settler house, sugarcane field and a lumberjack unit and lot more tent and hut variations. Download Unknown Horizons (Debian, Ubuntu, OpenSUSE, Fedora, Gentoo Linux and Arch Linux packages). If you have an older version installed, uninstall it, remove .unknown-horizons folder from your home directory and then install the latest version.